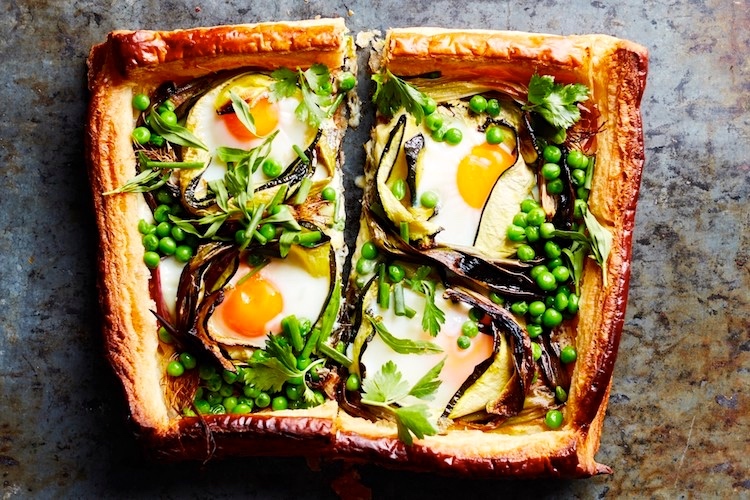 The weather can be capricious this time of year, but this savory tart [Zucchini and Egg Tart With Fresh Herbs], adapted from the food writer Anna Jones’s new vegetarian cookbook, “The Modern Cook’s Year” (Abrams, 2019), suits any shade of spring. Store-bought puff pastry is topped with mustard-spiked crème fraîche, swirls of zucchini, custardy eggs and an abundance of fresh greens. Way too tricky for my cooking abilities. Especially for a little Easter brunch. This entry was posted on April 13, 2019 at 8:49 am and is filed under Errors, Language and food, Word exchanges / reversals. You can follow any responses to this entry through the RSS 2.0 feed. You can leave a response, or trackback from your own site. I made it, and it is overly precious and a but much. It tasted good, but I couldn’t get the fussy basket part right, so it was just a big mess. A tasty big mess. Everyone here at AZFooDeVille thanks you for undertaking this task and reporting on the results. We are considering re-doing some of the details so that the dish can be framed as an eccentric kind of pizza, in which case it’s *expected* to be a tasty big mess.